Earnest Ice Cream has recently opened up an ice cream parlour to sell their ice cream in. 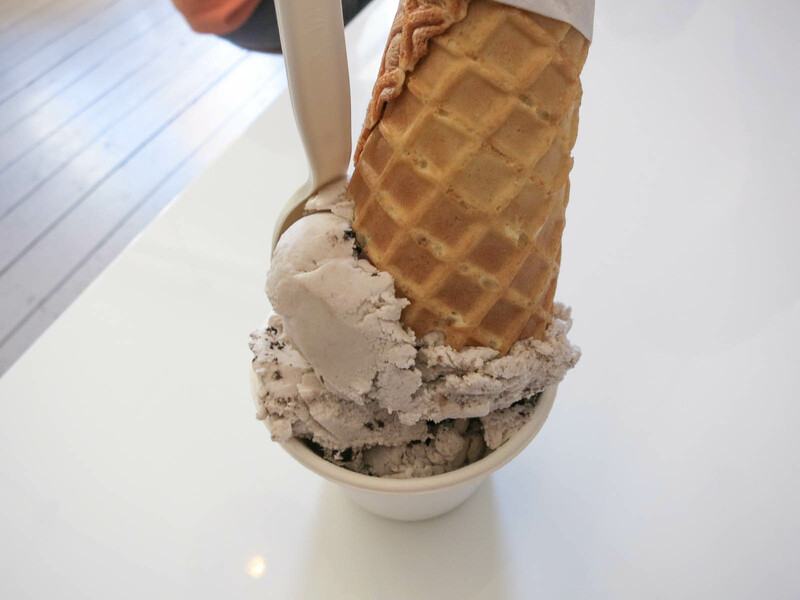 Their menu is simple and it consists of cones and espresso. You can also buy jars of ice cream to take home here. I had the vegan cookies and cream ice cream. Since I avoid eating dairy, I normally have fruit flavoured sorbet at ice cream/gelato shops, so it was nice to see a flavour that broke away from the standard fruity option. After one lick I was hooked on this stuff. The vegan ice cream has a more crumbly, dryer texture than regular ice cream, but it was still rich and indulgent. I believe they use coconut milk to make it because along with the chocolately cookie flavour, I also picked up hints of coconut. I loved the vegan ice cream. The ice cream here will damage your wallet ($5 for one scoop, $7 for double scoop), but it is delicious and high quality. I appreciate the fact that they have dairy free options, so it is well worth the money for me for a special indulgence. Yes, for amazing ice cream.